Air travelers will be able to set more flexible itinerary in staying one night before their flights at the airport or taking naps until next morning when they arrive midnight. On the other hand, local citizens can enjoy bathing and relaxation at the unusual space of ‘Airport Onsen Resort’ whenever they like. ‘Manyo-no-yu’ provides valuable period sharing with your family members, friends, and colleagues at the airport. They try to help setting of good memories of your journey through providing fine food and suitable places for relaxation. ■Variety of menu items, such as traditional ‘Kaiseki Dinner Course’ with local food materials and reasonable snacks. ■Selection of Yukata kimono among 8 kinds for ladies, and Yukata or Samui style kimono for gentlemen. ‘Manyo-no-yu’ creates higher stages of amenity in the clean and safe Japanese style facilities, mainly based on natural Onsen, and including other facilities, such as Ganban’yoku (岩盤浴), wellness and relaxation rooms. 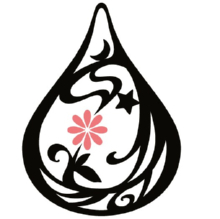 ■Proving natural Onsen water. Variety styles of bathtubs, such as outdoor bath, amusement bath, bed-style bath, sauna, mist-sauna, skin rubbing. ■Free rental wear and towel. No bathing items are required. ■All your billｓ are recorded on the cashless bar-chord system so no cash is required while enjoy staying. ■Free resting areas for taking nap. 81 among 276 seats are reserved only for ladies. Ganban’yoku (岩盤浴) is Japanese term for a popular form of hot stone spa. It is said to have originated in Thailand. Body-sized stones, such as granite, are inserted into the floor and heated. Bathers lie clothed on the stones while their bodies gradually heat up. Like low temperature saunas, ganban’yoku are commonly advertised to have a detoxification effect, improve the circulatory system and are good for the skin. A ganban’yoku room in a spa would typically be visited after the baths and would be in clothing-on area with mixed genders. Maifan Stone (Chinese 麦饭石 or 麥飯石), also known as “bakuhanseki (Japanese 麦飯石),” is a special mineral rock used in Chinese medicine to treat various skin diseases. It is composed of minerals including but not limited to plagioclase feldspar, orthoclase, feldspar, hornblende, and biotite (all four mentioned before are silicate minerals). Maifan Stone contains plenty of micro-nutrient elements, such as calcium, iron, zinc, magnesium, copper, and selenium, all essential to a healthy human body. As a Chinese medicine, it is especially useful in treating skin tumors and ulcers. In addition to that, many mineral water manufacturers in China dissolve a small amount of Maifan Stone during the preparation of their product, meant to enhance the micro-nutrient density in the water. In ordinary cooking, both rice and tea, while being washed, may be dipped with Maifan Stone to increase their effects on health. ‘Manyo-no-yu’ is available 23 hours between 10:00 in the morning and 9:00 in the next morning. You will make good use of your time when you arrive a little earlier than your boarding time in early morning or late at night. All facility is available even after the airport building is closed, such as rooms for guests stay overnight, easy chairs good for resting and taking nap and resting area exclusive use for ladies. Accessible to business lines with Wi-Fi（wireless fidelity） in the facility. ■ Opens 23 hours a day throughout the year. Available even after the terminal building is closed. ■ Adjustable your itinerary by staying at guestroom or relaxation room, such as coming one day before your departure, taking early or late flight. ■ Accessible to business line by Wi-Fi（wireless fidelity）. *Admissions for Adult & upper senior school students include \150 local tax for bathing. *Normal charges include charges for rental Yukata, bath towel, and face towel. *Additional charges will be put on the normal charge after 1:00 at midnight which include breakfast. *Early morning charges include charges for bath towel and face towel, but exclude for Yukata (\400) and breakfast (\1,000). Normal room rate per person is \4,000, including admission, additional charge, and local tax for bathing, however it is changeable according to number of guests sharing with one room and type of room. 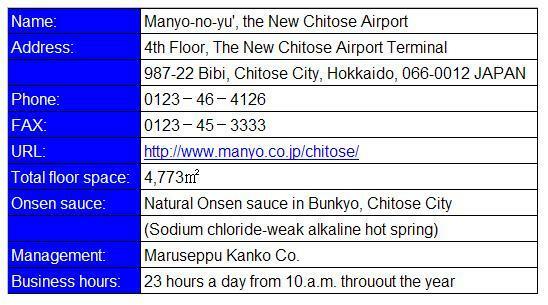 As a certified guide-interpreter in English and also a writer of the website “Cool Japan Guide”, I am very happy to introduce ‘Manyo-no-yu’ at the New Chitose Airport in Hokkaido. If you have something to ask, like to make reservation, or need English speaking tour guide when visit to Hokkaido, please feel free to contact us. Thank you for your kind cooperation, I am looking forward to your contact.